I hope your last weekend in July was a nice one! Before we photographed this outfit, David asked, "Is this one for vintage week?" Ha, no, but I suppose it does have a retro silhouette. I pulled out some old (circa 2004) garments from my closet to create this look. I've never put this top and skirt together before, but I'm please with the result. Happy Monday! I thought it was vintage too! I also thought it was a dress! Haha. The combo looks really cute on you! You are soo beautiful! This outfit totally has a vintage Audrey Hebpurn-esque vibe. You wear it so well! I think the pairing works well! My dear Mary Ann ! Stunning and sensational as always. Once again love that beaming million dollar smile of yours that is so endearing to viewers.The green floral skirt is lovely and the black top beautiful ! you look great, lovely smile, adore your sunglasses. Ha ha, this outfit definitely has a vintage feel. It's so pretty! 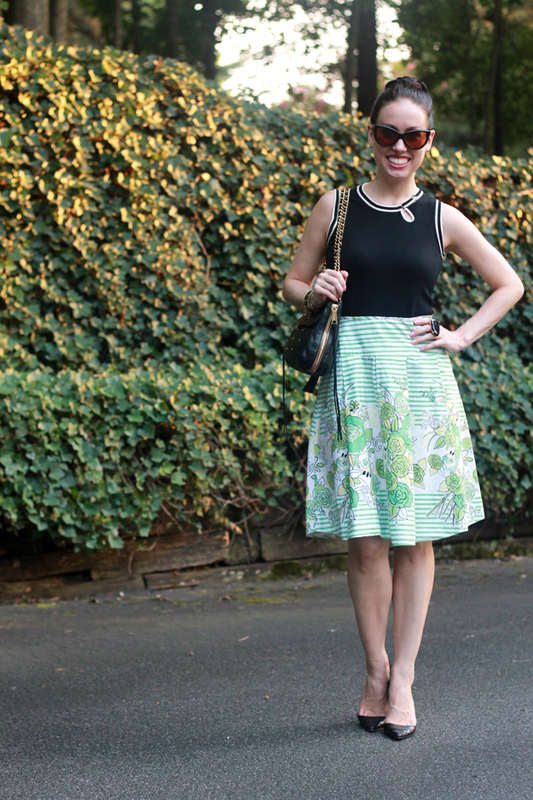 I'm obsessed with mixing florals and stripes and love that you have it all in one piece! Love that skirt! Definitely a vintage silhouette with modern pieces. I also thought this was vintage! Perfect classic outfit! i love the shape of this skirt! and those heels are like the best thrifted finds ever! love ittt! and your hair looks so pretty here - it's got an adorable vintage movie star feel to it. Thanks for stopping by my blog :) Thought I would stop by and say hello as well. I'm pretty much drooling over the Rebecca Minkoff bag. I've had one on my wish list for awhile now!! Glad you like BISTM & hope to "see" you there. He's right...this outfit does have a retro vibe! Love it! 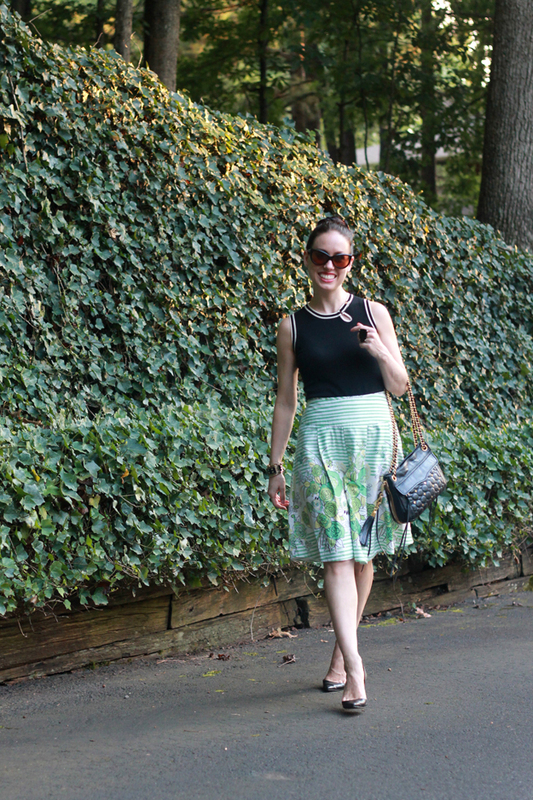 i have to agree with the lady above i can see that audrey hepburn spirit in your style too;) what an adorable skirt! I love your bag! This outfit does have a vintage feel. Cute! ohhhh this looks a bit retro! i like it! ^__^ and thank you for your comment on my blog! Love the print on your skirt! So pretty!! hello!!!! thanks for stopping by my blog, and for your lovely and sweet comment... your blog is so cute! I love it! do you want us to follow each other??? please let me know ok! Amazing outfit! love the sunglasses and the skirt!!! You always look so sophisticated! I wish I still could locate clothes from 2004, goodness. I'm so late checking out vintage week...but just caught up with all the incredible looks. No one does vintage like you Mary Ann! Gorgeous! Very pretty, Im obsessed with your handbag! i'm in love with your skirt. ooh I like your stripe skirt! looks pretty on you! I like that skirt Maryann! This is a great look! I can't wait for the next vintage week! I love this skirt. Great pattern.